How many times have you heard location, location, location? One of the best things about living where I do is definitely location. athletics, art, music, community education. I'm also near the museums and Hermann Park. There's lots of shopping and good eats in Rice Village. 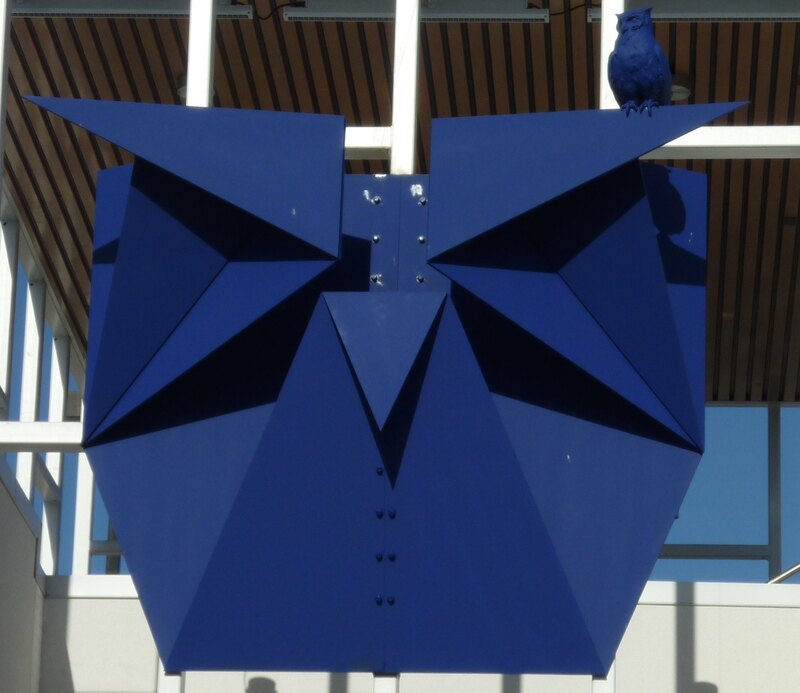 The latest public art installation in Rice Village is an owl by California artist Nathan Mabry. are a nod to Rice University. "While researching Rice Village, I became interested in the vibrant history of the neighborhood and proximity to Rice University. I find myself particularly engaged with the mascot of Rice University, the Owl," Mabry said in an announcement. "It's a powerful symbol in both antiquity and contemporary life. My work has long explored the depiction of birds from all facets of art history." The Owl weighs 868 pounds and took 8.3 hours to install. It's a fun addition to the neighborhood. I'm also near the Zoo. The zoo always celebrates Spring with a Spring Fling for some of its members. Usually it is a breakfast. This year the zoo decided to make it Breakfast for Dinner and hold the event in the evening. Breakfast was delicious -- with the best biscuits and gravy I've had in awhile! I invited my next door neighbors and can say that a good time was had by all! And even the adults had fun watching the zebu. He put on quite a show. His keeper asked him to walk in a circle. He did and he was given a treat. all except the Llama who seemed quite put out! A good friend took me to lunch. only spot to get good, fresh vegetarian food. They have now added the "regular" food for those who just can't live without their burger. I had the "slim" Gandalf. Their wheat bread is amazing. Avocado, mushrooms and melted cheese. You can pick your side - black beans for me. no way I could get my mouth all the way around to take a bite. Wishing you well, much joy and a "Hoppy" Easter! ...well owl be, they sure are cut kids, zebu is nu to me, lunch looks great and Happy Easter. You do seem to live in an ideal location. Our nearest zoo is about 75 miles away so it's been a while since we've visited. Your sandwich looks delicious. A delightful post to read, Snap -- and love that origami owl sculpture! Interesting art work! And Happy Easter to you! Wow over 8 hours to install that...that is a long time. Glad you had fun at the zoo and your sandwich sounds good to me! Well you certainly live in a great location with a lot to see & do. 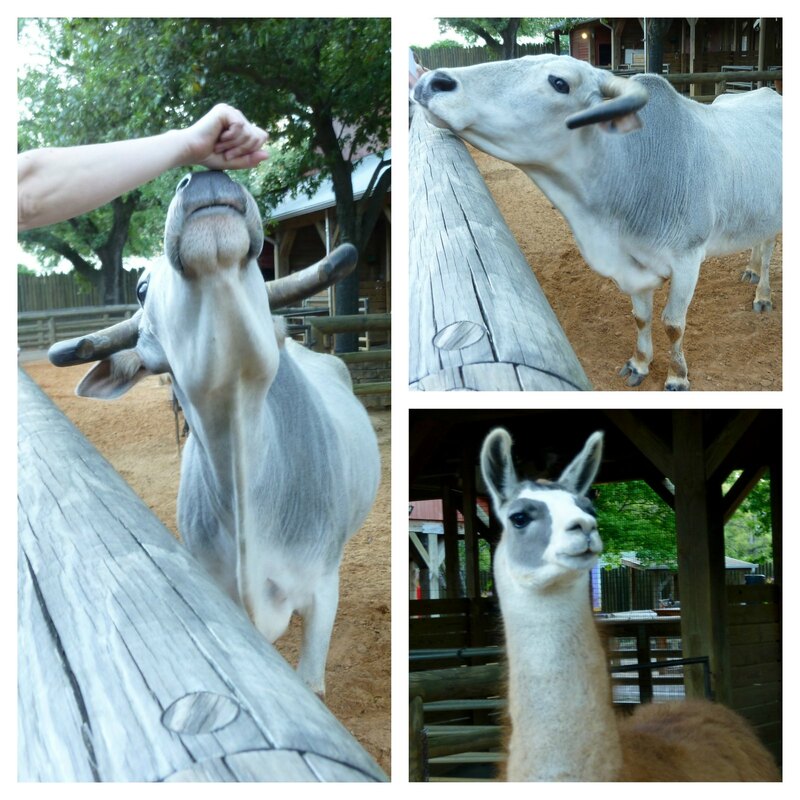 Zoo's are fun places & those kids painted faces were so cute. I originally came from Alabama... that being said, I have a cousin who was also raised in Alabama and now she is the head coach for the Rice Owls Women Basketball team. We are all so proud of Tina Langley, Miss Head Coach!! Delightful post. The llama pic was a hoot. Definitely a lovely location. I think wherever you live you can find beauty all around you and something going on. You just have to explore a little and make new adventures. 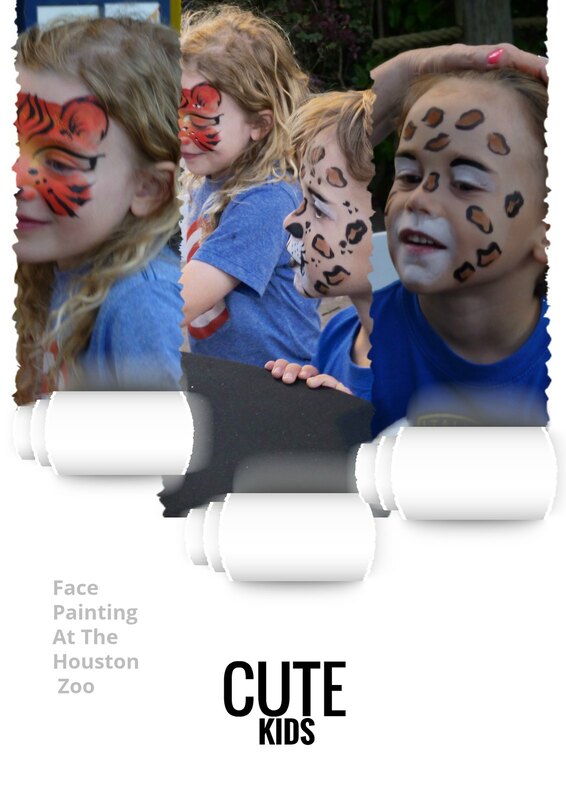 Great photos - the kids are really cute <3 and the blue origami owl stunning! Have a happy & sunny Easter! Sounds like a perfect location to live. The owl is fascinating and must creat different shadows depending on the light and time if day. Your sandwich looks delicious! 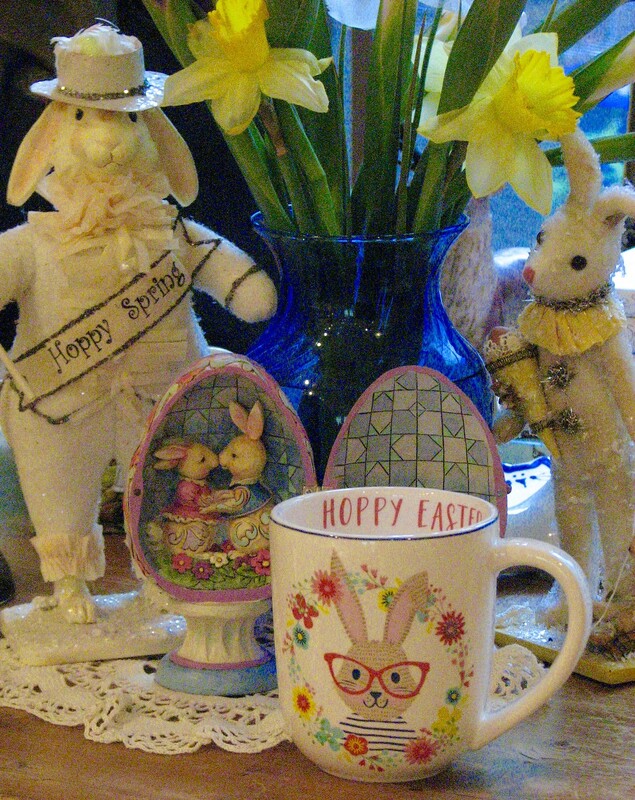 Happy Easter and have a lovely weekend. The Hobbit sounds like my kind of restaurant - yum. Hi Snap. I love that you love our town. Houston has it all from "owls" to Cooper's hawks! We were at the Hobbit Cafe last week and I can never pass up the Gandalf (slim with fruit). I so enjoy your blog and many of your same hobbies. It was fun to see and hear about the place where you call home, the owl sculpture is just wonderful. The event at the zoo looked like fun for everyone, especially the little kids! I think I'd choose the Fatty Lumpkin too, my mouth is watering just looking at the photo of your Gandalf! Very interesting post and good outings. Love the owl origami, such imaginations make wonderful art. Face painted kids are delightful. 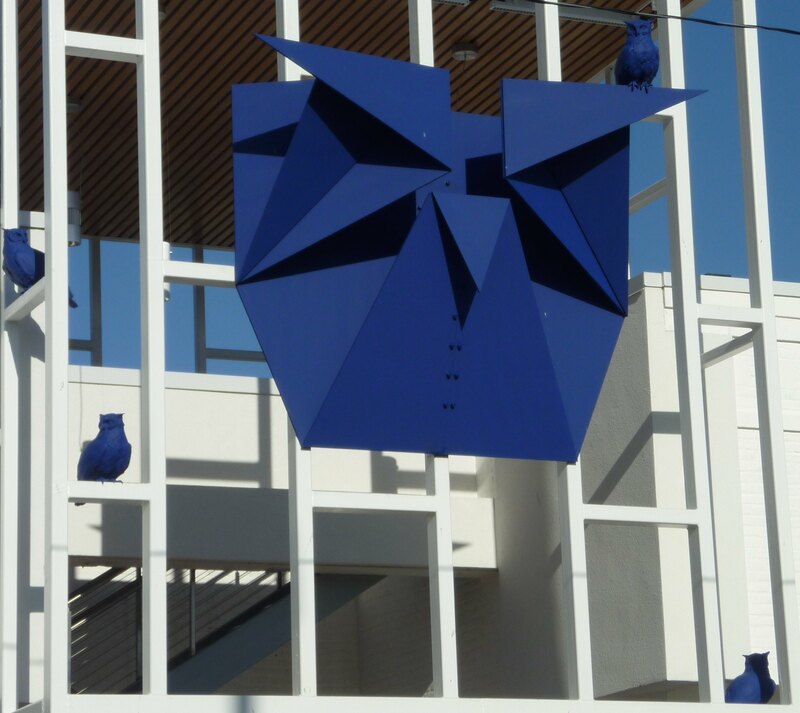 What a fantastic shade of blue the owl sculpture is! Snap, You scored on location. It`s great to be close to attractions. I love the face painting, the color of the owl is terrific, and the sandwich looks delicious. Thanks for sharing. Have a great day. Sylvia D.
Great locations! 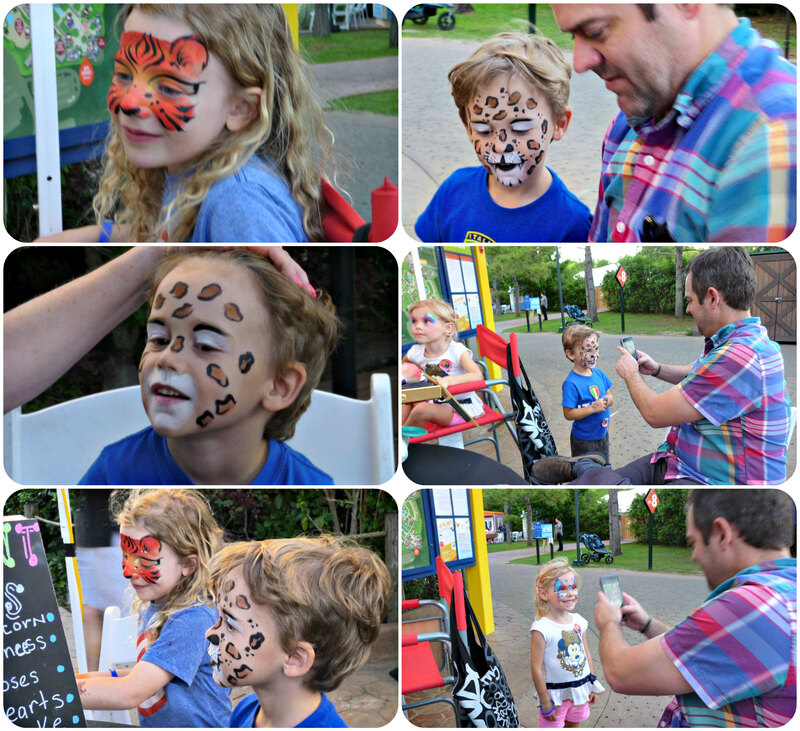 Kids do love face painting, don't they? My DIL does it for parties and it's popular with the younger set. The owl art is unique and such a great colour. How fun to eat at a Hobbit restaurant! Have a good week, Snap. Biscuits and gravy, I feel I've missed out never to had tried this! All looks superb. Have a great week. What a joyful post! I love the owl -- very clever and I like the color. And the time at the zoo looks great. I can't wait for the day our Baby Grand is old enough to go to a petting zoo! 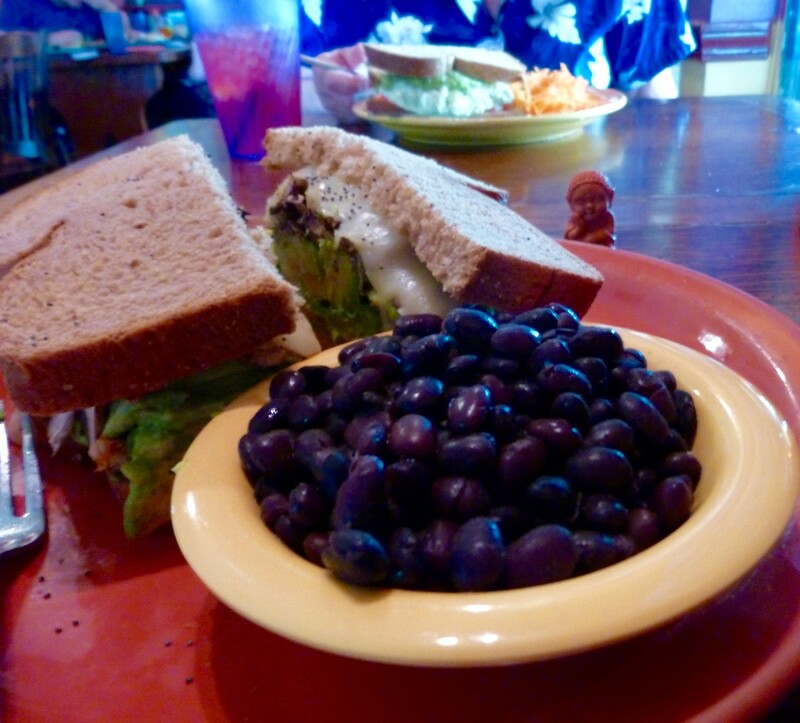 Your lunch looks fabulous! Thanks so much for stopping by Marmelade Gypsy -- I do like Monday Social! Well you should never get bored! What a great place you live in....I enjoyed seeing some of it! Thank you for linking!